The red panda, not to be confused with the giant panda (which it is not closely related to), is a species of tree dwelling mammal best known for their red-brown fur and striped tail. A red panda grows to about 64 cm (25 inches) in length with an additional tail length of up to 59 cm (23 inches). Like the giant panda, the red panda feeds on bamboo and is also found in similar areas. It can be found in parts of Tibet, India, Bhutan, Burma and China and lives at altitudes between 2,200 and 4,800 meters (7,200-15,700 ft). The range of the red panda has been reduced in the last hundred years and there are thought to be only 10,000 left in the wild. It is listed as vulnerable by the International Union for the Conservation of Nature (IUCN) and conservation efforts are underway to protect this animal. Let’s find out why these animals are endangered and what is being done about the problem. Why are red pandas endangered? There are multiple threats to the red panda and many of these are caused by humans. The two main threats are habitat loss/deforestation and illegal hunting. Habitat loss occurs with deforestation or with habitat destruction from domestic livestock and other farming practices. This reduces the habitat for the animal and also removes some of the food sources. This habitat loss can cause fragmentation in the population and this then creates loss of genetic diversity through the risk of inbreeding. Illegal hunting, called poaching, is also a great threat to this species and they are hunted for their fur and tails. In addition to this, red pandas have a naturally low rate of birth and a high death rate while living in the wild. The red panda is protected in all areas where it is found and many of the countries have setup distinct protected areas to stop habitat destruction. The red panda is also suitable for captive breeding programs and this means that zoos play an important part in maintaining genetic diversity. Currently there are captive breeding programs in Australian, Europe, the United States, India, Japan and China. 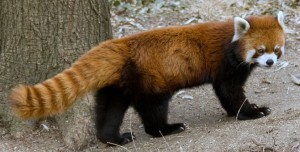 The red panda is also known as the lesser panda or the red cat-bear.